Pepe Bordalas prepares a substitution. Jaime Mata is replaced by Angel (Getafe). A yellow-coloured card is received by Mario Suarez (Rayo Vallecano). It is time for a substitution. Sebastian Cristoforo (Getafe) is on for Jorge Molina. Pozo (Rayo Vallecano) sends the ball into the box from the side of the pitch, but his cross is blocked. This yellow card was deserved. The tackle by Damian Suarez (Getafe) was quite harsh and Javier Alberola Rojas didn't hesitate to show him a yellow card. The resulting set piece from Getafe is comfortably intercepted by one of the defending players. Dimitri Foulquier (Getafe) tries to slide the ball through to a teammate but it's well blocked by a defender. The linesman points to the corner flag, Getafe are going to take it. The attendance for today's match is 11207. Dimitri Foulquier (Getafe) smashes the ball from the edge of the box and misses well wide of the left post. Pepe Bordalas has decided to make a change. Mathias Olivera Miramontes (Getafe) replaces Francisco Portillo. Substitution. Emiliano Velazquez makes his way off the pitch and Pozo (Rayo Vallecano) comes on as his replacement. Raul De Tomas (Rayo Vallecano) bangs the ball towards goal from the edge of the box, but it's rising all the way and sails high over the bar. The ball goes out of play and Getafe will have a goal kick. Goal! Jorge Molina (Getafe) scores after an assist by Jaime Mata that allowed him to tap in the ball into an empty net. The score is 2:1. Jaime Mata (Getafe) fails to send a pass into the box as his effort is cut out. The photographers scatter as a shot from the edge of the box by Mario Suarez (Rayo Vallecano) blazes well wide of the right post. Jaime Mata (Getafe) connects with a cross and powers a header goalwards, but his effort goes just over the bar. 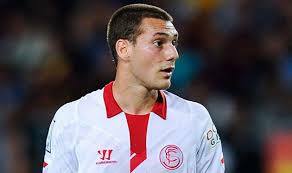 The referee stops play so that a substitution can be made and Mario Suarez (Rayo Vallecano) replaces Gianelli Imbula. Raul De Tomas (Rayo Vallecano) makes himself some space on the edge of the penalty area and pulls the trigger. His accurate effort goes off the post into the bottom left corner and the score changes to 1:1. Jaime Mata (Getafe) manages to dispossess his opponent of the ball, but he commits a foul in the process and the referee blows his whistle. Javier Alberola Rojas blows his whistle after Alvaro Garcia (Rayo Vallecano) brings one of his opponents down with a strong tackle. The game has come to an end for Adri Embarba. He has contributed as much as he could today. He will be replaced by the fresh legs of Alvaro Garcia (Rayo Vallecano). Adri Embarba (Rayo Vallecano) was trying to get to the ball but clattered into the legs of the opponent as well. Javier Alberola Rojas blows his whistle for an infringement. Alex Moreno (Rayo Vallecano) takes the corner kick and sends the ball among a huddle of players inside the penalty area, but one of the defenders clears it to safety. Ambitious effort from Nemanja Maksimovic (Getafe). He finds himself in a great position after collecting a precise pass inside the penalty area and goes for goal, but it never troubles the goalkeeper and flies well over the bar. Jorge Molina (Getafe) has a goal ruled out for offside! Damian Suarez (Getafe) makes a slide tackle, but referee Javier Alberola Rojas blows for a foul. Vitorino Antunes (Getafe) produces a lovely ball into the penalty area but the defender manages to intercept and comfortably averts the danger. Vitorino Antunes (Getafe) picks up a yellow card for an infringement. Referee Javier Alberola Rojas points to the centre spot to indicate that the goal stands after the VAR review. That prompts big celebrations from the Getafe players. Wait! The referee has now indicated he wants to check if the goal for Rayo Vallecano can stand using VAR. Jaime Mata (Getafe) connects with a pass inside the box and slams home into the top of the net. The goalkeeper was helpless. Vitorino Antunes (Getafe) sends a cross into the box, but Stole Dimitrievski comes off his line to gather the ball. The cross into the penalty area from Dimitri Foulquier (Getafe) needed to be more accurate in order to create a goal-scoring opportunity for his team. Vitorino Antunes (Getafe) crosses the ball into the box, but one of the defending players averts the threat. The linesman raises his flag. Jorge Molina (Getafe) is adjudged offside. Damian Suarez (Getafe) blasts the ball from just outside the box, but his attempt is blocked by the defender. Corner kick. Getafe will have an opportunity. One of the defenders reacts at the last minute to brilliantly block a pass from Jorge Molina (Getafe). Getafe have a corner. Jaime Mata (Getafe) climbs high to connect with a cross near the penalty spot but plants a header high over the bar. The ball is off of the pitch and it's a goal kick for Rayo Vallecano. Emiliano Velazquez (Rayo Vallecano) is penalised for holding. Javier Alberola Rojas signals a set piece. There is a free kick near the sideline to Getafe. Damian Suarez (Getafe) clearly holds his opponent to prevent him from getting the ball and the referee immediately stops play. Damian Suarez (Getafe) delivers a fine lofted cross into the penalty area, but it's cleared by an opposing player. Vitorino Antunes (Getafe) fails to find any of his teammates inside the box as his pass is blocked. Mathieu Flamini (Getafe) tries to create a chance, but puts too much weight on his pass. The ball goes out of play and Rayo Vallecano will have a goal kick. Jorge Molina (Getafe) launches into a thunderous tackle on his opponent and the referee blows his whistle for a foul. Rayo Vallecano will kick the game off. Javier Alberola Rojas is introduced as the referee for today's match.